There’s nothing more exciting than a high stakes cash game and PokerStars is the place where they take place. PokerStars Blog will give you the results and huge hands as they happen. We’ll also have extensive coverage of the biggest tournament series of the year, including WCOOP and SCOOP, where the world’s elite players battle it out for millions of dollars. 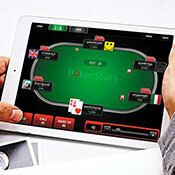 Stay with PokerStars Blog for all the latest from the online poker felt at PokerStars. Imagine firing up a $15 Spin & Go and seeing a 12,000x multiplier show up. Not only are you guaranteed to win a minimum of $15,000, but if you can beat the other two players you'll walk with $150,000.